Kaleb Thornhill, a former Spartan linebacker, remembers the day his grief turned to gratitude. It was February 2007. A rising senior, Thornhill was reeling from his 62-year-old father’s death just days before Christmas. His father was a tenacious, big-hearted Spartan linebacker who in the mid-1960s, under Coach Duffy Daugherty, helped shatter college football’s racial barrier. Fans called him Charlie “Mad Dog” Thornhill, and he left some very big cleats to fill. I began to realize how blessed I was to have grown up with a father who deeply cared about people, went out of his way to others, and inspired them by example, he said. “It allowed me to keep going and build something beyond myself. I was living for a legacy of the Thornhill name, the Spartan Nation and my kids,” said Thornhill, who’d followed his older brother Josh’s footsteps to become the family’s third Spartan linebacker. Nine years on, Thornhill is crushing it. 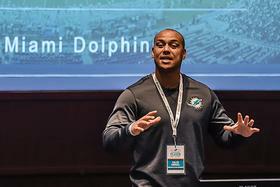 He’s director of player engagement for the Miami Dolphins, the youngest person ever to hold such a position. Throughout the year, he counsels the players—regardless of their ages and life stages. Translation: He’s the go-to guy for leadership training, career development, financial and investment education, real estate insight, improving family and social interactions, and post-gridiron entrepreneurship. A two-degree graduate of MSU—with a 2007 bachelor’s in social science and a 2009 master’s in education—Thornhill also earned a Ph.D., figuratively, in the power of positive thinking. In 2015, he and fellow Spartan football alumnus Travis Key teamed up to offer life-changing opportunities for even younger players in the Lansing area. Key, also a two-degree graduate of MSU—bachelor’s in 2007 and master’s in 2012—played in the NFL before becoming a packaging engineer at the Kellogg Co. Together they founded the nonprofit Apex Academy, a structured extracurricular program for qualified but under-resourced Lansing high school football players eager to become leaders, college graduates, and active members of their communities. Apex annually accepts 25 sophomores into its three-year program. They may hail from four Lansing high schools—Eastern, Everett, Sexton, and Waverly—as well as Three Rivers High School. The academy includes a yearly weeklong training camp at MSU, group community service, customized ACT and college prep sessions, financial aid opportunities, and career connections. “We have a great opportunity to give (teens) a great chance of going to college, to change their family dynamics, and to (eventually) have an income on which to raise and support their families,” Thornhill explained. He’s not stopping there. He recently launched Athlete Transition U, an organization that provides professional athletes with the education, experiences, and networks for successful business careers after their playing days are over.